Just invite the clients to connect their accounts, by adding their names and email addresses. After they connect their accounts, they will be added to your list automatically. Note: As soon as you reach the limit of a maximum number of accounts you can connect with SocialPilot (as per your plan), you cannot invite more clients. * Exception - You need credentials for Instagram accounts. How to invite a client? You can invite clients by adding their names and email addresses. Once they connect their accounts, you automatically get access to those accounts. Click on 'Team & Client' -> Invite clients, from the left sidebar menu. You'll see the 'Invite Client' page. Select the social network for which you want your client to connect his/her account. 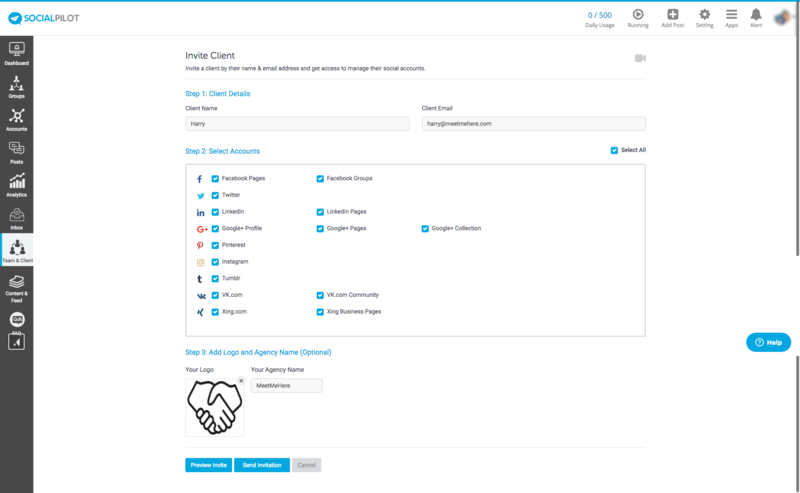 For instance, if you select 'LinkedIn', the client will be able to connect only LinkedIn account(s). Click on 'Your Logo' box to add your company’s logo. Add your company's name in the box provided for 'Your Agency Name'. You can see an invitation email and edit the content by clicking on the 'Preview Invite' option. You can also edit the email address and use your company's address (instead of SocialPilot’s) while sending the invite to your client. This video tutorial will also guide you through our Client Management process.